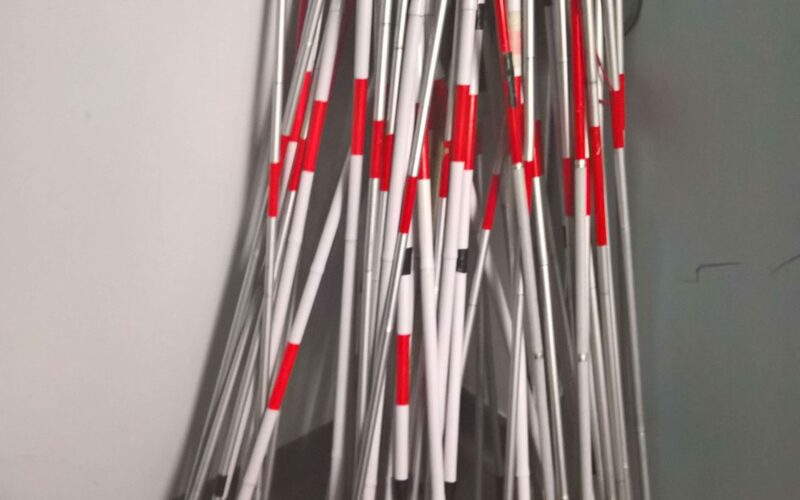 Commonly known by many names including blind cane, blind person walking stick or the blind people stick, the white cane or the long cane has helped the blind and the visually impaired to move freely and with ease for a very long time. The way that the cane is used is by sweeping the area in front of you in the direction that you are moving to ensure there are no obstacles in your path, much like a sighted person would look ahead of them for the same reason. One common question that is asked is “what size or length of blind cane do I need?”. The length of the cane is of some importance as it determines how early or how much ahead of you, you can detect an obstacle and thus directly affects your ability to travel safely and independently. In this blog post, Team BAWA Cane Team discusses how you can pick the correct length of white cane. How can choosing a wrong length for a white cane affect you? Choosing a wrong length for your white cane can make walking a painful and tedious process as you are forced to take small unsure steps. This results in either not being able to walk as fast as you want or walking faster than your cane allows and risking bumping into people or objects. Thus, choosing a cane that is too short can be uncomfortable and can make movement unnecessarily hard. When it comes to choosing the right length of your white cane, there is no single rule to be followed but care must be taken to try out a few lengths and determine which length is the most effortless comfortable and feels most natural to you personally. So how do you find the correct length of white cane for you? Here are a few ways in which the cane length is typically chosen that you could use as a guideline. 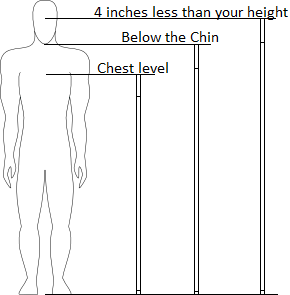 One of the more common methods of measurement is to pick a cane that goes from the ground up to your sternum or your chest area when you are standing in an upright position. Some people prefer a cane or stick that one end comes up to their chin when both you and the stick are upright and its other end is touching the ground. Another popular technique of how to measure for a blind cane is to choose a cane that is approximately 4 inches shorter than your height and will come up to your nose if stood vertically upright. Longer canes will give you more sweeping length and thus allow you to walk faster. This could even be a good alternative to a guide dog. However, it will be heavier than the canes that are shorter and could invariably be harder to handle for long periods of time. This could pose a problem especially for an elderly person who is blind or who has experienced significant vision loss. Also, it will not be as compact as a shorter cane when it is folded down. There is no single fool-proof procedure to choose the right white cane length but keeping these guidelines and advantages of each type of cane in mind you can pick the length that works best for you. Try it out yourself and pick the length that you are most comfortable with. For more such articles and to be part of our community, register below with your email and we will be in touch with you. Read on how we cared for our blind elderly grandmother here. Read on how to guide a visually impaired person here. Tarun Mark Nair contributed to this blog post during his internship with BAWA Cane.